On the occasion, a senior doctor from Shaukat Khanum Memorial Cancer Hospital, Lahore addressed the students and enlightened them about the effects of smoking on human health. 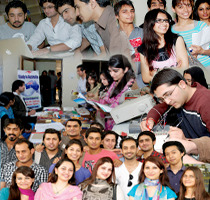 A seminar on “Effects of Smoking on Human Health” was organized by the Peshawar Campus of Preston in May 2011. A team of doctors from ShaukatKhanum Memorial Cancer Hospital, Lahore participated. Dr. Shamrez Khan, the team leader, addressed the students and enlightened them on the subject. In his keynote address, Dr. Shamrez Khan highlighted the effects of smoking on human health. He said the effects of smoking are serious and in many cases, deadly. There are approximately 4000 chemicals in cigarettes, hundreds of which are toxic. The ingredients in cigarettes affect everything from the internal functioning of organs to the efficiency of the body’s immune system. Dilating his views on the subject further, Dr. Shamrez Khan said that there are several likely ways that cigarette smoke does its damage. One is oxidative stress that mutates DNA, promotes atherosclerosis, and leads to chronic lung injury. Oxidative stress is thought to be the general mechanism behind the aging process, contributing to the development of cancer and cardiovascular diseases, he maintained. On the occasion he also gave a detailed presentation on Shaukat Khanum Memorial Cancer Hospital.